The projects displayed in this collection emphasize the formation of new structures in dialogue with their urban surroundings through careful consideration of historical context, materiality, form, and programmatic connections to public space. The BBC Radio Headquarters project was probably the practice’s first to approach to questions challenging urban context. 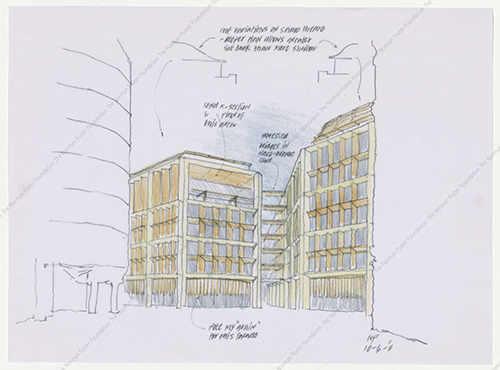 The project would have occupied an entire block, tremendously heterogeneous both in morphology and historical value, the most notable component being John Nash’s All Souls, Langham Place (1824). The studies of Cavendish Square’s evolution through time demonstrate an explorative process which unearths historic layers of the built environment in order to further develop its most salient qualities. The BBC Radio Centre was planned as a combination between public and private, occupied by the BBC workforce, in a two-directional response to inwards and outwards circulation; to inside and outside. The challenge was to integrate both and make them work. The many iterative massing models for the BBC Radio Headquarters and Carré D’Art Me?diathe?que speak to the ways in which these buildings respond to the profiles of neighbouring structures and the patterns of public space surrounding them. The Carré D’Art Me?diathe?que process drawings explore how the outward form and internal circulation of the building will programmatically and formally relate to the adjacent Roman temple, the Maison Carré. The surrounding urban space was planned following the Roman grid to recreate three streets along the main building´s perimeter. It was not only about paying homage to the historical context, but creating a public forum which brought a new range of possibilities to the city centre, redefining its spatiality and its social qualities. Ultimately, a screen-like glass and steel portico, seen in the main model, meets a plaza rededicated to pedestrians surrounding the temple. A space that was previously dedicated to cars was given back to pedestrians, creating a meeting point where history, architecture and citizenship converge in a civic stage set. When tackling the volumetric approach of the Bloomberg European Headquarters, it was compared the final building to St. Paul’s Cathedral. The maximum building envelope originally suggested overcame the iconic Cathedral. Rather than compete with the height and iconography of St. Paul’s, the Bloomberg European Headquarters addresses the street in order to carve a distinctive block interior. The arcade bisecting the two main volumes of the Bloomberg model represents a publically accessible continuation of Walting Street, the old Roman road at the heart of the City of London. The building’s unique sandstone and bronze cladding clarify how the building’s details create a distinguished new addition while remaining within a profile respectful of the surrounding historic city.